Robots can work continuously for the entire day without complaining but human beings cannot. After working for a couple of hours, humans get tired and bored. To give 100% at work, you’ll have to relax your mind by taking short breaks, chatting with friends or co-workers, etc. If you’re not a social person, you can entertain yourself or relax your nerves by installing fun apps on your Android device. The applications will kill boredom or loneliness. The reason why you are bored is you haven’t used YouTube app or you haven’t explored cool YouTube channels yet. YouTube hosts tons of funny videos, documentaries, short clips, funny discussions, prank call videos, etc. To find a video, you must use the search tool of the app. Whenever I’m bored, I kill time by listening to prank call videos shared by my favorite YouTube channel. I also watch shows that I’ve missed on the television, upcoming movie trailers, scenes from my favorite movies, etc.YT enables users to create channels. 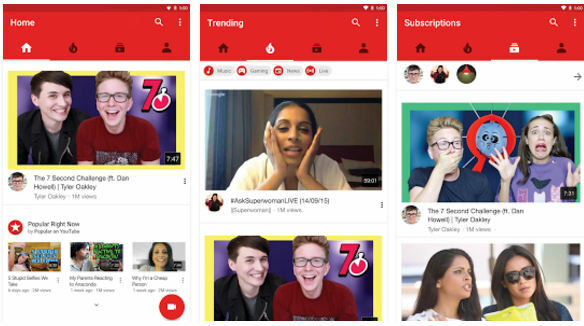 Once your channel is ready, you can upload as many videos as you want. YouTube is the best fun app for Android. Gifs have taken the internet world by the storm. Several social networking websites allow you to share GIF images. 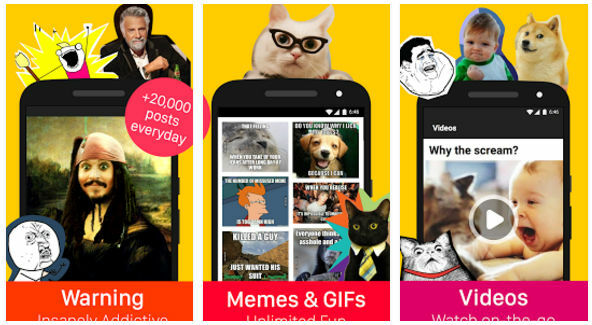 The best way to find and share the coolest GIFs is the 9Gags app. Apart from the animated images, you’ll find short clips, MEMEs through 9Gaga app. 9G is a community-driven application where users share stuff they find interesting. The app lets you download images and videos to the mobile device. It also allows you to leave a comment on them. The app categorizes published posts in several categories. You can subscribe to your favorite categories. 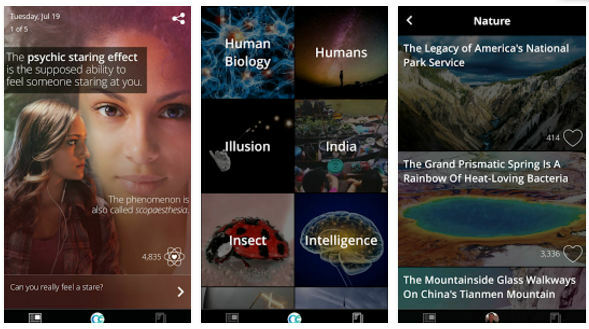 The Curiosity app packs 10000+ amazing facts that will surprise, thrill, entertain or shock you. Once you’ve read a fact, you must swipe downwards or upward to load new fact. You can also browse the app’s category to find facts. The app has answers to the questions that you can’t answer. It lets you watch interesting videos. You can bookmark or share a fact that you find interesting. Curiosity app kills your time and at the same time, it makes you learn something new. Reddit is one of the few apps on the Google Play Store that can give you a healthy laugh. It is the ultimate app to waste time and refresh the tired mind. The app has 200+ communities called subreddits. It provides an option to subscribe to subreddits. If you want to use Reddit for self-entertainment, create a Reddit account and subscribe to subreddits that allow Redditors to share funny videos, images, jokes, stories, etc. When you do so, the app’s main interface will be flooded with posts shared in the subreddits you’ve subscribed to. Reddit app has a beautiful UI. Unlike 9gags, it plays GIF files automatically. It enables you to share new content. You can share the existing posts on social networks or other sites with this application. You can also save posts which you’ve enjoyed reading. Reddit is a free app that you can use without registration. It doesn’t ask users to verify the email address during the account registration process. Vine is a video streaming service owned by Twitter Inc. It enables users to record and share short 6 second videos. Best Vines is a third-party app that filters 1000s of videos and gives you access to videos that will either surprise you or bring a smile to your face. The app has an easy to navigate interface. It lets you browse the vast collection of videos and save videos that you have enjoyed watching. The great thing about this app is that it supports Android 2.2 devices. MF is an app that turns your phone into a farting machine. The app detects the motion of the user. When the user lifts his leg up, the app will play a random fart sound. 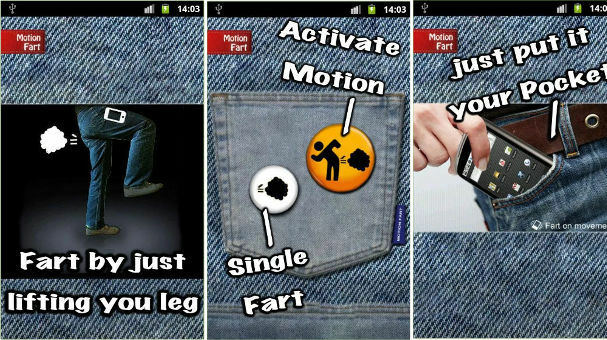 MF provides a button to enable the app’s Motion Fart module. When you activate this module, put your phone into the pocket of your dad, mom, wife, co-worker and wait for him to get off the chair. When the person gets up, the app will play a fart sound and everyone standing beside you will burst into laughter. 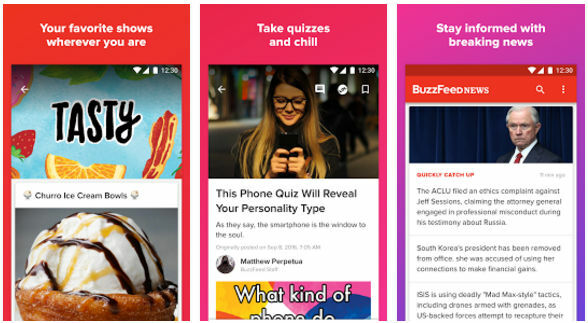 BuzzFeed is an application that allows you to go through interesting content shared by talented content writers. It lets you play interesting quizzes and watch hilarious videos. BuzzFeed has a news section where you’ll find the latest news. 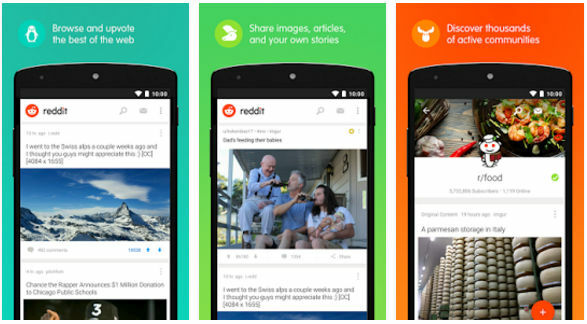 The app has a search tool and it enables you to bookmark your favorite posts. It lets users share their favorite posts and images embedded in the posts on other sites. BuzzFeed supports push notification. It allows you to comment on stories. Conclusion: The above 7 apps will entertain you whenever you’re bored. Make sure that you install and use them during free time.